Britney Spears may have just played with an American hockey player's heart after proving she wasn't lost in their gold medal-winning game. 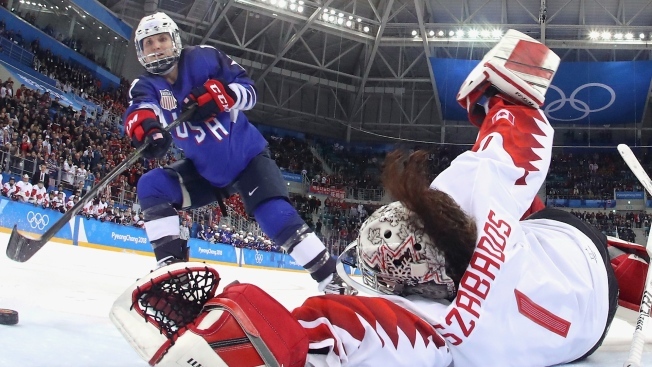 Jocelyne Lamoureux-Davidson scored the shootout goal Thursday that won the U.S. its first women's hockey gold medal since 1998. Afterward, she explained that her goalie-fooling triple feint had a name: "Oops, I Did It Again," after Spears' smash hit "Oops!... I Did It Again." Here's how the shot breaks down: "There's the fake shot, which is the 'Oops,' the fake shot to the backhand, which is the 'Oops, I Did It," and then there's the fake shot to the backhand back to the forehand, which is the "Oops, I Did It Again,'" Lamoureux-Davidson explained. Lamoureux-Davidson and her sister, who's also on the team, learned the shot from their college coach. It won praise the rest of the hockey world, including American hockey's 2014 shootout hero, T.J. Oshie, who tweeted the "bowing down" emoji at her. And on Friday, it got a shout out from Spears herself. "Quite the goal by @jocelyneUSA17!! Congrats to the women’s @usahockey team on bringing home the #Gold!! #Olympics," Spears tweeted. Lamoureux-Davidson hasn't commented on the tweet beyond retweeting it.